Everybody likes to be recognized when they do good work. Our data has shown that people who receive Cheers are more central to the organization as a whole and show less voluntary turnover. It's also shown that people who receive Cheers are typically higher performing. So basically, Cheers = longevity with the company and high performance. It's always nice to receive TINYpulse Cheers (and think about what it means for your career), but you have to get the ball rolling by sending them. Not to mention how good it feels to recognize deserving people for their hard work. Sending Cheers is a fun and painless experience. With a variety of options, there's never a shortage of fun ways to send a delightful Cheers to a teammate, mentor, business partner, etc. Cheers are super easy and accessible to send. Here's a complete list of places where you can send Cheers from, at any time you'd like. 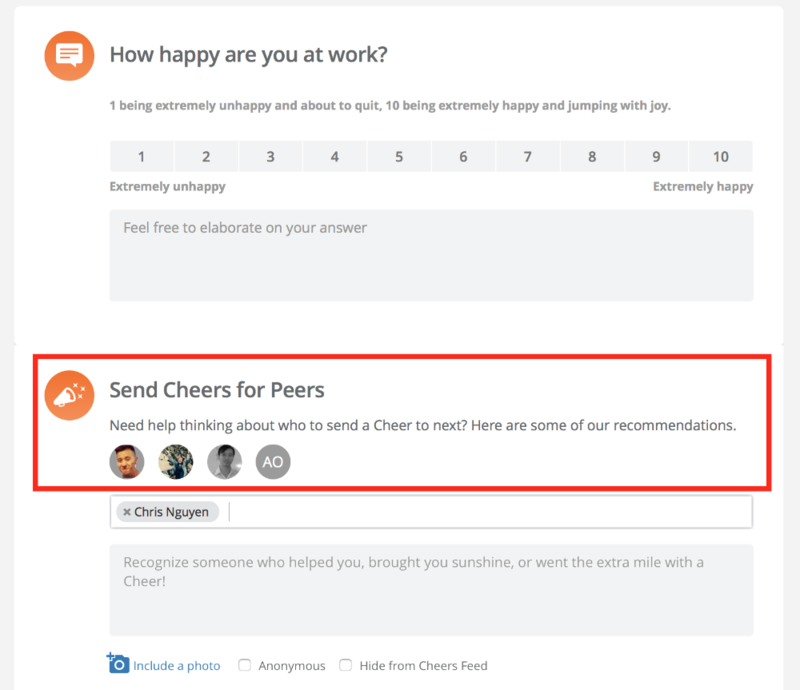 In your employee portal: Log into TINYpulse whenever you'd like to send Cheers. Send one from the main Dashboard page or click the (+) icon in the top right corner and you'll see the Send Cheers option. By using the TINYpulse mobile application: Download the TINYpulse mobile app for iOS or Andriod and send Cheers on the go. Through the TINYpulse Google Chrome plug-in: Install the TINYpulse plugin for Google Chrome to send Cheers whenever inspiration strikes. You never even have to open a new tab! With the Outlook add in: If you live in Outlook, the TINYpulse add in for Outlook is a handy way to send Cheers directly from Outlook without having to visit TINYpulse. In Slack: If your organization has enabled TINYpulse for Slack, send Cheers anytime with the TINYpulse-bot for Slack. The two requirements for Cheers are to specify a recipient and write a message. However, there are some fun extras to make them unique. Add a photo: Adding a photo to Cheers makes them more fun. Plain and simple. Take a moment to attach a nice photo for some personalization by clicking Include Photo. Cheers with photos also make your company Cheers feed look awesome. Include a GIPHY: Giphys make Cheers even more fun! 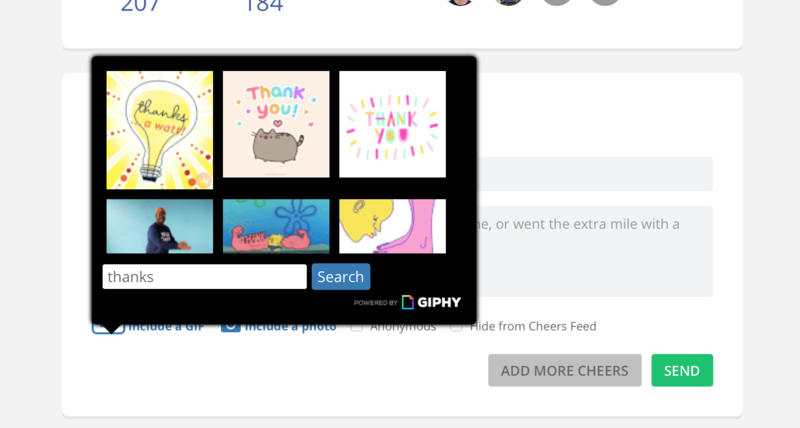 Just click the Include GIF button before you send a Cheer, then search through the GIPHY library for the perfect GIF for the recipient. Give a TINYgiftcard: If your organization has enabled TINYgiftcard and given you access, you'll see a third Include a TINYgiftcard. Learn how TINYgiftcard can help give your recognition programs a boost and speak with your friendly TINYpulse administrator if you think this is a good option for your company. Send anonymous Cheers: Sometimes you want to spread positivity without drawing attention to yourself. Generally, we think it's good for the recipient to know who the sender is but we completely understand if you want to remain discrete. If you check the Anonymous Cheers box, neither the sender nor your administrators will know who sent the Cheers. Your Cheers will still appear on the public Cheers feed and on any reports created by your administrator, but the sender name will be "Anonymous". Note that if you choose to send an anonymous Cheers, you cannot attach a GIPHY or image. This restriction is in place to prevent potentially abusive or harmful images being sent under the veil of anonymity. Also be aware that abusive Cheers can be reported to us at TINYpulse to have them removed and investigated if they are threatening or harmful. If you're concerned about anonymity, take a look at our commitment. 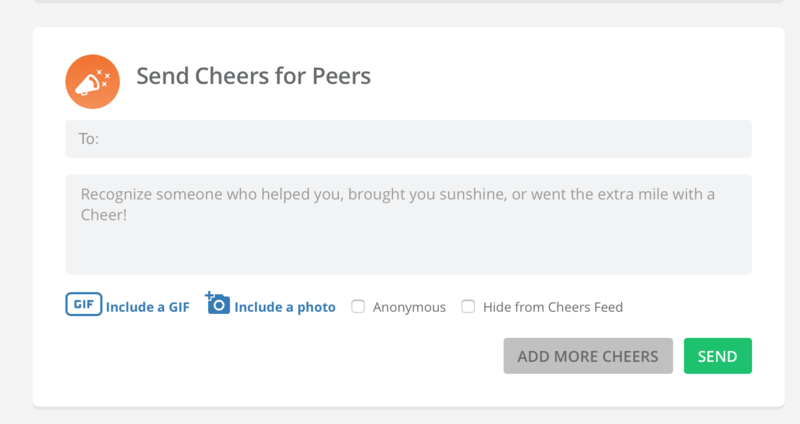 Hide Cheers from the feed: If you want the recipient to see that the Cheers is from you, but you don't want to publicize it at your organization, check the Hide from Feed Administrators will still be able to see the sender and receiver, but it won't be shown on your company's scrolling Cheers feed, the Cheers Slack channel if you have Slack integration, or on the LIVEpulse Cheers feed if you're company has it turned on. 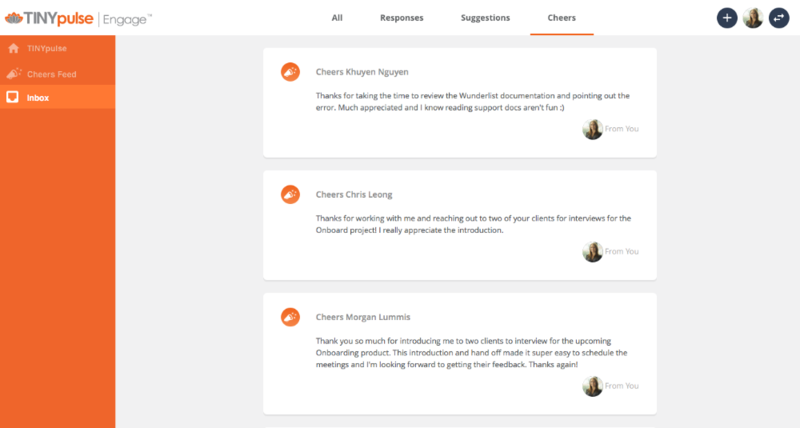 All throughout the TINYpulse Engage employee experience will you see Cheers recommendations; on the survey page, on the Cheers page, after you take the survey, and more. This is designed to help you send Cheers when you can't think of a candidate off the top of your head. Just click on the person's photo and it will pre-fill the recipient field so you don't have to wrack your brain trying to remember their email address. TINYpulse offers many different methods for viewing Cheers. Click the link in the Cheers email: You'll be notified by email whenever you get Cheers. Just click the link to view it in TINYpulse. View your Cheers sent and received history in your inbox: Once you've set your password, you can log in to app.tinypulse.com and go to your Inbox using the left navigation panel. This inbox shows your entire TINYpulse history including Cheers sent and received, survey responses, and suggestions. Slack: You administrators can set up a real time Cheers feed as a new channel in your company's Slack application. Check out this article to learn more about Slack integration or contact your company's TINYpulse administrator to see if this is right for you. LIVEpulse Cheers feed: LIVEpulse is the best way for companies to improve their transparency and give employees more visibility into TINYpulse. It also allows employees to see a real time Cheers feed in their TINYpulse view so they can take a scroll through to see the positivity floating around whenever they'd like. Consider turning on the LIVEpulse suggestion feed if you're an administrator and are interested in becoming even more transparent and open with employee feedback. Scrolling Cheers feed: Administrators can access the scrolling Cheers feed which is perfect to put up on a public TV in your office. Employees can take a few minutes to look at it for a constant reminder of the good work that's being done, with a bit of extra recognition at the same time. Your Inbox in Coach: Again, if your company is also subscribed to Coach, all of your Cheers will live in your 360 Inbox where you can share them with your manager or attach them to your goals to support your performance. Don't keep those Cheers hidden! You've done great work so make sure to add them to a goal to support your performance. Want to brag about the awesome Cheers you've received? Share it to social media! Share your Cheers to Facebook by clicking the Share to Facebook button when you're viewing the Cheers in your LIVEpulse account. You can add your own text, links, and hashtags and then you can post it for all of your friends, followers, and connections to celebrate. If your administrators have enabled the live Cheers feed in LIVEpulse, you'll be able to vote for your favorites! Just go to the Cheers Feed in LIVEpulse using the left side navigation. Read through the Cheers that have been sent at your organization and click the thumbs up icon if there's one that you particularly like. If you've clicking the thumbs up icon by mistake, just click it again to remove your like. If you're an administrator and want to enable Cheers "liking," go to Settings -> Apps -> LIVEpulse and make sure the Cheers feed item is selected (or activate the main LIVEpulse Enabled toggle to offer employees maximum functionality and transparency. The next time employees log in to TINYpulse, they'll be able to see the Cheers Feed option in their left side navigation. 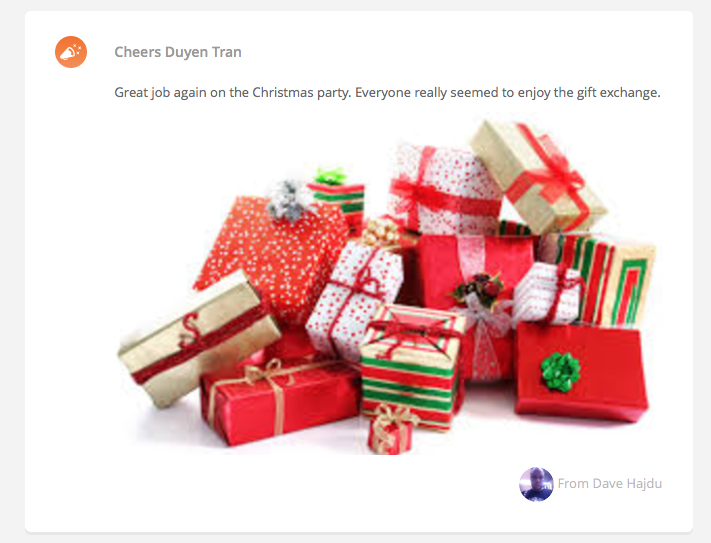 If you've received a Cheers and want to thank the sender for their kind words, you can send them a 'thank you' email right from TINYpulse! If you're viewing Cheers in TINYpulse, just click Say 'Thanks'. Then, type your message and click Send Your Thanks and the recipient will get your message via email. This is just another way that TINYpulse helps employees spread positivity so don't forget to say thanks for the recognition! Your personal Cheers network is a visual representation of who you most frequently send Cheers to and receive them from. Think about this as your "social" network at work. You can use this chart as a way to quickly see who may need your recognition and who to thank for their appreciation. You can see the Cheers network once you have an employee account. Just set your password then go to the Cheers tab to check it out. I am so happy with my whole team because we engage ALL in several activities very often and given the nature of our job we do so very often. I feel compel to send bulk Cheers all the time. Then I understood that by doing so I would not make it personal hence more recognizable and rewarding. Can we have the possibility to send Cheers to everyone similar to what you have on the Dashboard for people scoring toward a question?